YellowAirplane.com: Russian Antonov Aircraft, Model Airplanes, Books, Airplane Pictures, and Videos. 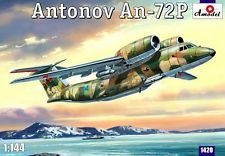 Russian Antonov Aircraft Model Airplanes, Books, Airplane Pictures, and Videos. In terms of longevity and sheer numbers Antonov Aircraft built, the Annushka An-2 - affectionately known as Annie - has few parallels. Indeed, limited production of this aircraft, which first flew in 1947, still continues in China and Poland. An easy-to-fly and robust aircraft, it is ideal for utility operations and is the only biplane transport to serve in the 21st century. On the larger scale the Antonov An-12 Cub was the Soviet Union's equivalent of the C-130 Hercules: a versatile and long-serving military and civil transport that, from the mid-1960s, played a part in virtually every major aviation event of its country. A tremendous Russian aircraft the An-24 Coke was designed in the late 1950s first as an airliner and then as a tactical transport for the Soviet Air Force. Later, the An-26 Curl introduced a sliding cargo ramp, leading to the "hot and high" An-32 and the "big head" An-30, specialized for aerial photography. This page includes plastic model airplane kits, diecast aircraft models, books, videos, DVD movies and pictures of the various Antonov Russian Aircraft. Click Here for Russian Tanks and Military Vehicles. Maid of All Work. Gordon & Komissarov. In terms of longevity and sheer numbers built, the Annushka An-2 - affectionately known as Annie - has few parallels. Indeed, limited production of this aircraft, which first flew in 1947, still continues in China and Poland. An easy-to-fly and robust aircraft, it is ideal for utility operations and is the only biplane transport to serve in the 21st century. 128 pgs., 220 color and B&W photos, 8"x 11", sfbd. From the Webmaster: This is one of the most preferred arctic aircraft in the world. It is larger than it appears in the picture. We find an An-2 on the North Pole every year and every time that I took pictures of these planes, something happened and all of the photos were lost. You can look at all of the planes in the 2002 North Pole Exhibit by ing here. Gordon & Komissarov. This heavily illustrated volume covers each variant of the An-12 four-engine turboprop transport aircraft (the Soviet counterpart to the Lockheed C-130 Hercules), providing a detailed account of its service career - from its design and development, through its first flight in 1957, to its present-day use by the Russian Air Force and by China as the Shaanxi Y8. 128 pages, 250 B&W and color photographs, 8"x 11", softcover. Gordon & Komissarov. The Antonov An-12 Cub was the Soviet Union's equivalent of the C-130 Hercules: a versatile and long-serving military and civil transport that, from the mid-1960s, played a part in virtually every major aviation event of its country. This book traces the development and operational history of this craft, which is in frontline service with many operators even today. 200 pages, 300 B&W photographs with 8-pages of color photographs, 8"x 11", hardcover. Staszak & Staehr. Covering the C-119, C-124, C-160, DHC-5 and Antonov AN-12, this heavily illustrated volume provides a capsule history, key configuration data, interior details, walk-around photographs, information on unusual markings and schemes, and more for each type presented. A fine reference on a unique set of aircraft. 82 pages, B&W photographs and line drawings, 8"x 11", softcover. This thrilling program takes you to Moscow's major airports and to Dresden, Bratislava and Sharjah to view Soviet- and Russian-built airliners in the 21st century! You'll see massive propliners such as the Ilyushin Il-76, veteran Il-18 and Antonov An-12; 1960s jetliners such as the Il-62 and Tupolev Tu-134; exotic color schemes not often seen outside eastern Europe; and much more. 1 hr. 5 min. Gordon & Komissarov. This heavily illustrated book examines the great variety of civilian aircraft - including Antonovs, Tupolevs and Ilyushins - supplied to the export market and Soviet satellite states prior to the collapse of the Soviet Union as well as those that have come to dominate Russian sales in the past decade. 160 pages, 160 color photographs, 8"x 11", softcover. AN-24/-26/-30/-32. Gordon. The An-24 was designed in the late 1950s first as an airliner and then as a tactical transport for the Soviet Air Force. Later, the An-26 introduced a sliding cargo ramp, leading to the "hot and high" An-32 and the "big head" An-30, specialized for aerial photography. This richly illustrated book presents their histories and lists all known operators on a country-by-country basis. 128 pgs., approximately 200 B&W and color photos, 8"x 11", sfbd. Wingspan 95' 9 1/2", Length 78', Height 28', Empty Weight 33,113 lbs., Max TO weight 52,911 lbs., Cruise 273 mph, Max Climb 1,575 fpm, Ceiling 24,600, Range Max Payload, 683 miles. TO run on concrete 2559 ft.
From the Webmaster: I have flown in both the An-24 and An-26 aircraft. It was very surprising to see how much payload that these planes could lift. We first flew in an An-24 from Norilsk, Siberia to Khatanga, Siberia. This was an executive airplane with tables and nice seats. We stuffed this plane with 23 people, not counting the crew, and a huge amount of supplies for our North Pole Expedition. We had a blast. Next we took the An-26 from Khatanga to Srednij Island in the Severnia Zemila Island group above Siberia. The plane had a huge plastic fuel tank inside the fuselage. Next we loaded the plane with all of our equipment and luggage. When we got into the plane the only place to sit was on top of the luggage. We did have portable cloth seats for some people, but we were packed into it very tightly with some people having to squeeze into a small space next to the internal fuel tank. We took to the plane to the North Pole and later flew back in the same plane. The runway cracked so many times that we ran out of room to extend the runway and did not have enough room for the plane to take off. The pilot revved the motors then pulled the nose up as high as he could get it. We did finally get off of the ice and we did survive, as you can tell. It was because of the extremely cold temperatures that the propellers, engines and wings worked better than the specifications on minimum runway length. These planes were very impressive and everyone had a lot of respect for the planes and the pilots. You can see pictures from this expedition by ing Here. C. Jeff Dyrek. Red Star Vol. 21 The An-72/-74 Family. Gordon & Komissarov. From first prototype in 1977, through mid-1980s production, to multiple variants that ranged from armed border patrol to flying hospital, this book covers the state-of-the-art Antonov twin jet tactical airlifter - NATO codename "Coaler" - that even serves as a commercial airliner. 128 pages, 200 B&W and color photographs, 4 pages of color artwork and 4 pages of line drawings, 8"x 11," softcover. From the Webmaster. This is the kind of plane that we now fly to the North Pole. It is real interesting because the engines are on top, above the center of gravity. I asked the pilot about if there was any pitch down when giving it the gas and he said that on landing approach, if you are not very experienced with this kind of airplane, you can definitely stick the nose into the ice. I'm a super lucky person because I get to visit the cockpit on the flight. It's like flying on another planet when you are looking out over the pole. Here to see the Exhibit on Arctic Russian Aircraft. The Remainder of the Story. It was like looking down to a lower level while sitting in a theater. The other expedition group was a dog sled expedition and they had their equipment and dogs with them. These were some of the bigger dog led dogs that I have normally seen. It was really interesting because the dogs wanted to roam around and see everyone. They walked on top of many people just to get to see other people. These were really nice dogs and it was a good experience to have them come and visit. I'm just guessing, but it seemed like about four hours before we came to Khatanga. The sun was still up because it never goes down at this time of the year, but the storm was so bad that it was almost totally black outside. The plane swayed back and forth as the pilot kept realigning his flight path for the ILS approach to the runway as he compensated for the high wind gust. It was a little bit scary and everybody was holding on to something. However, we landed without a problem. When we got out of the plane it was really cold, much colder than my equipment was capable of withstanding. Everyone looked back and forth to each other and said, "Lets go back to the North Pole to get warm." My fingers were really cold really fast and I had to pull them into the palm of my outside glove to keep them warm. My boots were rated down to -45 degrees and they were not warm enough. There was a light snow blowing and the sky was jet black. I have the picture in my photo album, but somehow it didn't scanned in, possibly because it was just too dark and I didn't think it would look good on the site. If you would like to see the actual planes in 2002 North Pole Expedition Exhibit, just Here. Go back to the start of the story. Big Lifters for War and Peace. Gordon & Komissarov. This book examines Russia's amazing, mighty transports starting with the An-22 "big lifter" and proceeding on through the An-124 - which boasted a 392-ton takeoff weight and a 120-ton payload - and the 600-ton An-255 Mriya, designed to piggyback components for the Energiya/Buran space transport system. 128 pages, 200 B&W and color photographs, 8 pages of line drawings, 8"x 11", softcover.